27 great returns on 14 years of professional given for many anecdotes. The Giro d'Italia is a very special race for all its packaging, for the great love of cycling, because Italy is a very special country and because the Giro d'Italia is the center of attention throughout Italy, equaling that month follow the beautiful game "Football" (football). Nor I'm going to find anything, athletically speaking, not you've seen or read about the Giro, just say that for me, I've run seven, It is the most beautiful race of the big three thousand details surrounding the Corsa Rosa that would fill many pages. I keep details of how flower petals showered the passing of the peloton by populations, details to stand in front of the peloton some ice cream factory to taste their products, Details of feeling unconditional public support for their "Rosa Carrera" and all participants. From the story I will tell you could write a novel, before escribirlo me he thought it several times, but I think it's an interesting and funny story, view with the perspective of time, but not so much when it happened and a few years ago. 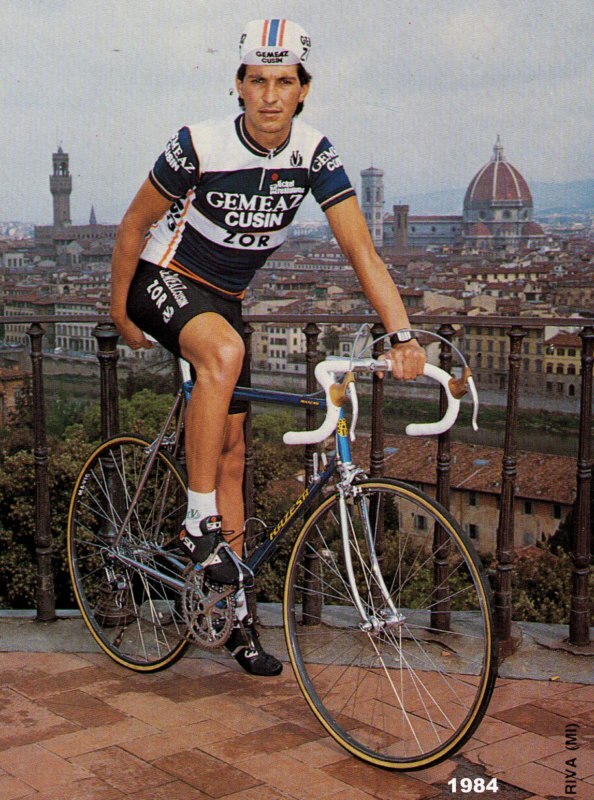 In 1990 ran with Team ONCE my fifth Giro, he did not for some six years with the team Zor-Gemeaz, team that made the last four in 1981,1982, 1983 and 1984. The story is outlined, when half of the Giro, about one day out of the area Moon: an amateur girl to cycling 1,80 m tall with hair down to her waist, of splendid and beautiful feminine attributes and a great guy who did not go unnoticed. After the presentations and kisses rigor gives me his card and tells me that if I return to Italy I stop by to say hello Bologna, all very nice here, It never happened anything like, Would there be something fishy? The fact is that his voice did not fit her femininity, confirmed my suspicions turned out it was a transvestite who liked cycling. It was a funny story and that was that as another story of the many around us that led to the laughter and comments post stage team dinner. Moon was very fond of cycling and racing cyclists attending was a big fan of cycling and cyclists fascinated him in sporting terms and I could also check on the extradeportivo. After that day I saw her a couple of steps more, he came to see him coming stages better. When I had more confidence, One day she came to tell me that he liked us a lot and Federico Echave, being so high, tans and skinny. I laughed and did not give more importance. 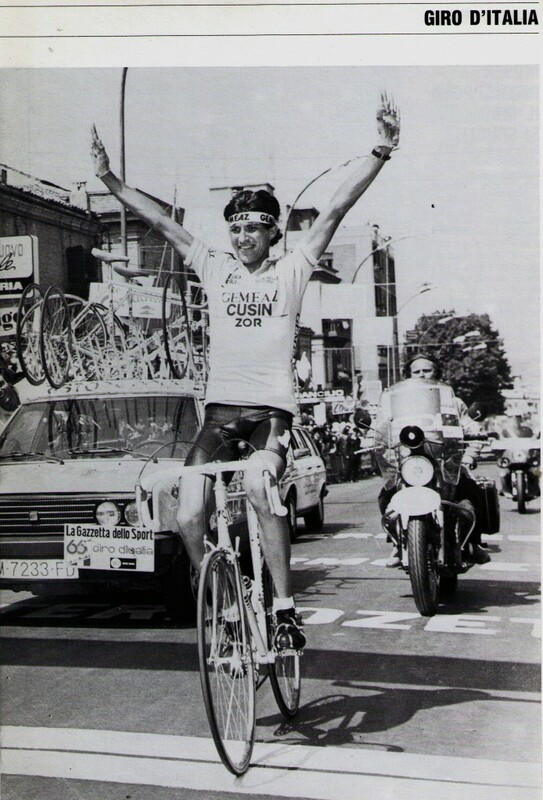 Giro and finished that besides my stage win at Vesuvius had a little story to tell. Giro was always fun things, years ago in my first Giro, a contest was held on the Sabbath, It was a gala where they chose the prettiest girl Miss Giro and other titles, as the friendliest cyclist, surprise was my first prize in the Giro and was not exactly giving pedals. They also gave a title, it is better not win, the ugliest of Giro, that year 1981 it was delivered to San Peregrino water delivery man who was in the advertising caravan looking at a window in the back of a van delivering water to everyone, I was little redheaded, I was all day in the sun, He was burned in two colors, Actually it was a fair winner. 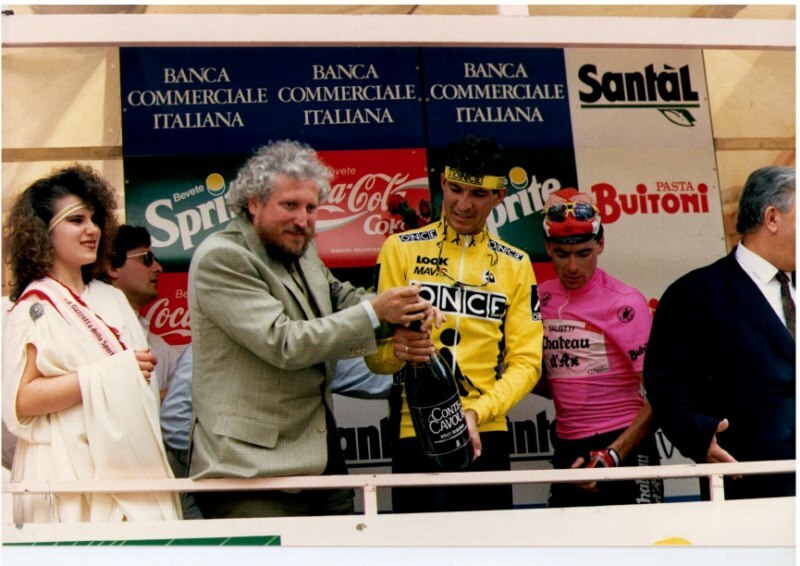 Returning to the story that I am telling, The following year I returned to the Giro, We talked of year 1991, ONCE team had just won the Tour of Spain Team and Melchor Mauri with General Classification. After a few steps appeared the moon race, and I not even remembered me from last year, He had no further contact with her, even thought you would read on to see, the fact is that I found myself right in front and I thought greet with a kiss and after the courtesy greeting goodbye, I went with the team to rest after the stage without giving more importance to the matter, the truth, It is that I looked like a sympathetic character. But it began to entangle thereafter. Now I smile at the memory but in the days following a chase began full-fledged, Moon had to intuit that my affectionate greeting gave rise to a possible relationship and began its offensive. Stage by stage came to see me at the start and finish, to such an extent that, those sets did not go unnoticed by the environment, Cyclists, auxiliary, principals and envoys of the Spanish media who followed the event. So much so that one day José Ramón de La Morena, Special Envoy Cadena SER, I spent a joke I do not know how to classify it. I realize that in a newsletter has made a live interview by telephone from the output stage Luna and had dropped a pearl: "He said on the air that he was in love with you and I could not help it" At that moment I changed the face and I said something I can not reflect here, pero you can imagine the. In the bunch that day had 179 cyclists and a zombie that just was thinking what would my friends, what would my family, how many would have to give explanations, what I had to urgently call my wife and tell before they found out by others, My head was not in the race. During the stage as he approached me pedal cyclists who had more confidence and they went asking about the matter. I asked Julián Gorospe, Santos Hernández and other Spanish cyclists if it was true about the interview and what Luna had said, all that if I deci, all were in cahoots with De la Morena. Just get to the hotel I called home and asked my wife if she had heard something, I told, she laughed out loud. If it had been a girl another rooster would have sung, the case was exotic and amused. At the end of the interview what was a joke, It was not true, but for many days was the protagonist of Giro by extrasport merits and I spent a lot of jokes. While he is suffering jokes environment, the whole squad knew "ours" Moon was still in his desperate attempt to have a relationship with me. But my attitude changed after the happy little joke, everyone was watching us and it was no longer funny and embarrassing it was committed, I felt persecuted. Moon kept coming out to see me every day, photos was done with me, It never left me and I got to escape, when he looked at the exits in an area, behind the fences, awaiting my arrival I changed side, no sidewalk, never better said. As the days passed and everything was the same, I started to get a little worried about the feelings you may have Moon, and gave me a little respect the situation. Last week I won the high mountain stage finishing in the ski resort of Sestriere, that was very nice for all, Moon also was my best tifossi. Giro ended and he no longer had many opportunities to moon to be alone with me and decided to come see me, He was presented at the hotel with best wiles: dressed in a red miniskirt set the sexiest, blond hair fell around her waist, very well painted, very pretty, with his explosive figure. Javi, auxiliary equipment, I announced it was receiving and wanted to see me up, I told him to tell him not, but was later, I was already at the door of the room calling me, with his distinctive voice, I called me by my name: “Eduardo, Eduardo is here to see you, Eduardo …” I saw the gap left Javi trying to block his way but his corpulence, end coiled Javi, broke up before me trying to go away with him, Santos Hernandez who was with me, he got under the covers, Did not know anything, I was shaking me to the soul. I scolded Luna, I shouted that I would not see him again, that was, It was all like a dream, too fast and unexpected. I was impressed, I did not expect his audacity could reach both, on the other hand got to worry about your feelings so I decided to be sharp and cut short. There he finished this little story about “Giro things "now I can tell you with some nostalgia and smiling gesture but that made me live a few days of much disquiet,es. After a few months in Interviu magazine appeared a report on cases of sexual harassment famous people where I was the only man who appeared in the report. What do not you podíais imagine that these things could happen in Giro, truth? Me neither.